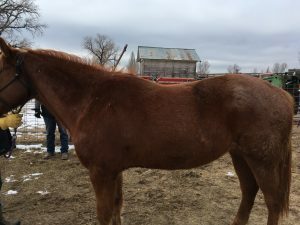 Abstract: Chance is an eight year old sorrel quarter horse gelding who presented for severe lameness in the front limbs and arthritic changes in the forelimbs. He also had a milder lameness of both hind limbs with the right being worse. Chance is a rescue horse with very little known about his past. The current owner rescued Chance and was told he had juvenile arthritis and previous veterinary advice was to euthanize. Chance received three acupuncture treatments in an effort to decreased pain, increase limb function and make Chance more comfortable. I believe that the treatments were beneficial because after his treatments Chance would energetically trot in his pasture and lick his lips as if he felt better. He also had a slight improvement in range of motion of hid carpal and fetlock joints. History and Presentation: Chance is an eight year old sorrel Quarter Horse gelding who presented on February 4th, 2018, for severe lameness and arthritic changes in the forelimbs. Chance is a rescue horse with very little known about his past. 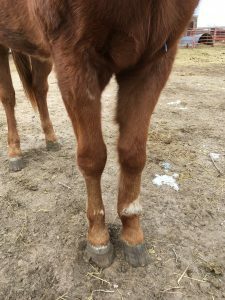 The current owner was told by the prior owner that Chance had juvenile arthritis and the previous veterinarian recommended euthanasia due to his joint deformities and severe forelimb lameness. There are no known veterinary records or diagnostics such as bloodwork or radiographs. This past year Chance had episodes where he would be three legged lame or would lay down for extended periods. There were times when the owner would haul food and water to him and would assist him in getting up. At this time Chance is not three legged lame or lying down for extended periods of time. Chance is a pet and serves as a companion for other rescue horses at the farm. He has received routine vaccinations and deworming. Physical Examination: Upon physical exam Chance was bright, alert and responsive. Temperature was 100°F, 14 breaths per minutes and pulse was 30 beats/minutes. He had a good body condition of 3/5 with 3 being ideal and his coat was in good condition. Cranial nerve, temporal mandibular joint palpation, neck flexion and mechanical receptors were within normal limits. Both carpi and fetlocks were enlarged with increased boney proliferation of the joints. These joints had a 30% reduction in range of motion due to their enlargements. Range of motion of the elbows were decreased by ~20% with a 30% decrease in lateral and medial rotation. No significant abnormalities were seen for scapular movements. There was a noticeable grade 3 out of 5 bilateral forelimb lameness. This lameness was seen at both a walk and a trot with head and neck lifting obvious. The weather during this exam was very cold and the ground was icy so the gator test and hind limb circling was not done. There was no response to spinal flicking but a slight resistance to spinal bending in the lumbar area. There was a grade 2-3/5 bilateral hind limb lameness with apparent stiffness seen in the right stifle and hock. Medical Decision Making: Discussed with owner that the boney proliferation and arthritis within the fetlock and carpal joints is irreversible. But my goal was to decrease Chance’s pain and discomfort and increase function in his limbs to help improve his quality of life. The decreased range of motion of the elbows, carpi and fetlocks correlates with the bilateral forelimb lameness. The goal of acupuncture and manual physical therapy would be to improve the range of motion of these joints to create a more fluid movement. By treating Chance with acupuncture it is my hope to decrease pain thereby decrease the incidences of three-legged lameness and inability to get up from a down position. Since Chance does not have any documentation of prior veterinary exams and diagnostics a thorough radiographic evaluation of all four limbs is recommended. A joint supplements and an anti-inflammatory like Previcox is recommended in addition to bloodwork. 1. The lameness is affecting multiple legs and joints so I suspect that Chance had multiple degenerative joint issues when he was young. This may have been due to excessive exercise and concussion to joints as a young animal or overeating post weaning which contributed to abnormal joint formation. The bilateral forelimb lameness and hind limb lameness is likely due to juvenile arthritis. the joint can cause swelling, release of destructive substances and subsequent abnormal proliferation of bone and cartilage. The swelling and tissue proliferation then caused restriction of movement and a subsequent lameness associated with arthritis. Acupuncture Treatments: Chance was treated once weekly for 3 weeks with 0.2 mm X 40 mm Seirin coated needles. This was the only size of needle Chance tolerated. Each treatment lasted 15-20 minutes and needles were in place for 10-15 minutes depending on how cooperative Chance was that day. The following parasympathomimetic treatments were placed first and used to help reduce anxiety and help Chance relax: Bai Hui, GV 14 and GV 20, LI 16 and ST 36 and PC 6 when he would allow it. Triple heater 16 was chosen due to the pain response when that area was palpated and its relation to the cervical plexus. GB 21 was used due to its association with the spinal accessory nerve and involvement with thoracic limb dysfunction. Large intestine 15, SI 11, SI 12, SI 12, and triple heater were used due to association with the scapular nerve and pain that may be associated with the shoulder. Chance was not tolerant of the placement of needles on the limbs but I would try to place LU 1 for shoulder mobility and LI11 for radial nerve stimulation and elbow pain. Chance tended to be sore in the lumbar spine so bladder points were chosen spanning the lumbar area (BL 21-25). Bladder 13 and BL 18 were also needled when Chance seemed tender in those areas. Gallbladder 29, 30 and BL 54 were chosen due to their association with hip problems and sciatic nerve pain. Unfortunately, Chance would not allow me to place any needles in his hind limbs. For physical therapy I would perform passive range of motion exercises on his fetlock and carpal joint for 20-30 repetitions post acupuncture treatments. During the first treatment Chance was the most cooperative. It was a very cold day and I think his arthritis was bothering him more because he was most lame at this time. The ground was very slick and icy so I think he was less inclined to move and slip. After his first treatment he had a ~5-10% increase in range of motion of the carpi and fetlocks. Post first treatment he trotted energetically and licked his lips as if he was experiencing some pain reduction. His owner even mentioned he was feeling a little better after his fist treatment. Chance’s pain reduction due to acupuncture may have been due to altering release of chemical like opioids, serotonin and cytokines as well as regulating inflammation and blood circulation (Kong et al., 2013 and Zhang et al., 2014). Chance was less cooperative for the next two treatments and I suspect that may have been due to the warmer weather and the excitement of spring. He moved around a lot after the needles were placed and needles tended to fall out quickly. He seemed more sensitive to the needle placement and I was not able to place all the bladder points and some distal limb points I wanted to try. He did trot more energetically and fluid after the 2nd and 3rd treatments but he did not have much change in range of motion of the fetlock and carpal joints. I think that acupuncture alone did decrease pain slightly and had a slight improvement in joint range of motion but Chance’s advanced chronic multi-joint arthritis needs the benefits of a proper radiograph consult, bloodwork, an anti-inflammatory like Previcox and joint supplements. An equine orthopedic consult would also be helpful. Chance is a sweet horse with a severe chronic arthritic condition but he was not the easiest patient to treat with acupuncture. On warm sunny days he is more energetic and it is difficult to place needles especially if he thinks there are treats in my pockets. I initially used treats and suspect that the thought of treats made him more excitable and interested in searching my pockets instead of remaining still. Due to this I do not think I will used treats as an equine diversion. Next time I treat Chance I think I will move him to the barn where there are less farm animal distractions (ie turkeys, alpacas, chickens, pigs, donkeys and other horses). Even though Chance was difficult to treat at times I think he did get some small benefits and slight pain relief from treatments. The condition of his joints are so severe that acupuncture alone should not be used as the only mode of pain relief. He could benefit from an anti-inflammatory, joint supplement and laser therapy. I think acupuncture would have been a greater benefit for him during the initial onset of juvenile injury so that it could reduce swelling and inflammation and possibly prevent future joint proliferation. It would be of value to research the use of acupuncture in the early onset of juvenile arthritis when young horses are beginning to show minor symptoms. Kong J, Schnyer R, Johnson K, Mackey S. Understanding Central Mechanisms of Acupuncture Analgesia Using Dynamic Quantitative Sensory Testing: A Review. Evidence-Based Complementary and Alternative Medicine. 2013. Volume 2013, Article ID 187182, 12 pages. Zhang R, Lao L, Ren K, Berman B. Mechanisms of Acupuncture-Electroacupuncture on Persistent Pain. Anesthesiology. 2014; 120(2): 482-503.